Alright ladies, our favorite season is quickly approaching. And like most women, I’m sure you’re beginning your search for new swag to stay fresh out on the slopes. But staying up to date with the latest trends can be exhausting, so we’re here to make life a little easier. Whether you’re into the slim look or a more relaxed, baggy ski pant, there are options out there for any taste. And if you’re not trying to break the bank, we’ve got you covered there too. 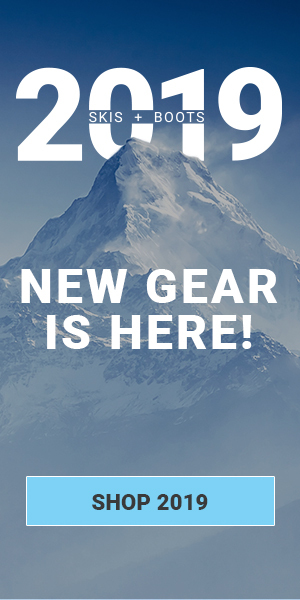 Explore our list of popular women’s ski pants, and treat yourself to something new this year – you deserve it. To read about Women’s Ski Pant Trends for 2019 please click here. The first trend that you should keep on your radar this year is a slim fit ski pant. As fashion continuously evolves, it seems to reference back to looks that were once in style back in the day. I’m sure you can remember a time where you looked back at old pictures of your parents and thought, “Wow, what the heck were they thinking when they got dressed?” But as soon as I realized bell-bottoms and velvet (clothes I once teased my mom about) were back in style, I shut my mouth real quick. That’s the beauty of fashion, even within the ski industry. What once started sometime around the 1960’s, thanks to the fashion runways and Audrey Hepburn, has surfaced once again. You will be seeing a lot of slim fitting pants on the slopes this year, I can guarantee it. 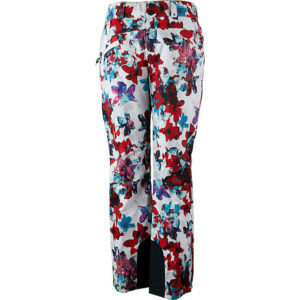 And if you like a little more personality in your ski swag, be sure to check out the Obermeyer Printed Bond Pants. Floral and eye-catching prints are big this year, so keep your finger on the pulse. Beyond just a slim fit, white is also an emerging trend this year. A great option at a fair price point is The North Face Freedom Insulated Ski Pants. It has a high warmth rating, with moderate waterproofing and breathability, making it a very versatile choice this winter. Other options include the NILS Betty Ski Pants or the Descente Selene Ski Pants. The great thing about white is that it can go with a lot. Grab some white ski pants and pair them with a funky print jacket to add a little more pizzazz to your outfit. Because the winter Olympics are just around the corner, a spirited trend you’ll be sure to see this year is red, white and blue gear. What better way to support your country, than to rep our colors out on the slopes? The Obermeyer Double Dare 4-in-1 Down Jacket is a perfect example of this trend. It’s slim fitting, very warm and extremely waterproof and breathable. If you’re looking for an all-in-one type of jacket, something like this will surely hit all the marks. And to stay on trend, be sure to check out slim fitting, white ski pants to complete the look. Or you can pick up a pair of red, white or blue pants to go along with what you already have and you are good to go! Another huge trend that has returned this year are bib pants. Does anyone else remember wearing these as a kid? They were my absolute favorite, but I never thought I’d be searching for a pair as an adult. These ski pants remind me of overalls out on the slopes and will definitely set you apart from the rest. The North Face Shredromper Women’s Bibs represent this look nicely. Pair them with a floral print jacket or a bright pop of color, and you have yourself a look that not many others will have! While they certainly aren’t new to the market this year, baggy ski pants will always be visible out on the slopes. 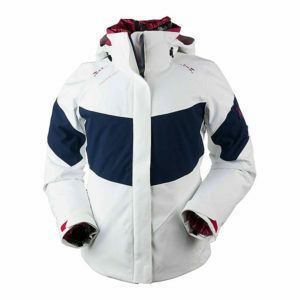 Undoubtedly more popular among snowboarders, the relaxed, baggy style can still be pulled off by skiers. The Obermeyer Keystone Women’s Ski Pants illustrates this look nicely and can be paired with most jackets. The last trend I feel obligated to highlight is the need to stay within a certain price range, because when has staying on budget ever been out of style? Listen, I get it. Ski gear isn’t usually cheap, so if you’re just starting out or wanting to get the job done without splurging, there are a few really great options. The North Face Sally Ski Pants come in a variety of popular colors, have a high warmth rating and will keep you dry and ventilated throughout the day. For just a few dollars cheaper, the Columbia Bugaboo Ski Pants makes a comparable version. But if you’re the type of girl that is just looking for a simple pair of black ski pants this winter, definitely check out the Obermeyer Sugarbush Ski Pants. It’s an amazing ski pant at a price point that’s unbeatable. Whatever your style preference or individual needs may be, keep these trends in mind as you hunt for the latest and greatest ski pants. At the end of the day, you like what you like, so pick something that you’re attracted to, regardless of what anyone else thinks! For more information on types of ski pants check out our blog on shell pants vs. insulated pants. Of course with the harsh winters coming in, ski pants become a must have for all those ski enthusiasts. These are some amazing and affordable varieties, which prove that one doesn’t need to sacrifice style for the cold weather.